In 2016, Chris Snider, President and CEO of EPI, wrote the first book on the Value Acceleration Methodology called Walking to Destiny: 11 Actions an Owner Must Take to Rapidly Grow Value & Unlock Wealth. The book is was written for business owners by a business owner. It’s a proven system to maximize value, grow income, and build a business that can run without you, even if you never plan to leave. And if you do think you won’t ever exit your business, the business owner who never plans to leave needs a well-functioning, attractive business more than anyone. He felt compelled to write a book to arm fellow business owners and their advisors with the knowledge and understanding to recognize their potential and actually know how to execute tactics to grow and harvest the wealth locked in their businesses. It is also designed to bridge the understanding gap between advisors (who EPI trains) and owners and get them on the same page. From an advisor perspective, the Value Acceleration Methodology has become the leading process for exit planning and is prominently utilized by exit planning advisors across the world. We want to change the outcome for business owners who have invested their lives in their business. To do that, we need to change the paradigm of how exit planning is perceived by owners. Exit planning is good business strategy. Exit planning is now. With readiness comes success, freedom, and wealth, and providing that roadmap on your walk to destiny is the purpose of Walking to Destiny. Are you a business owner? 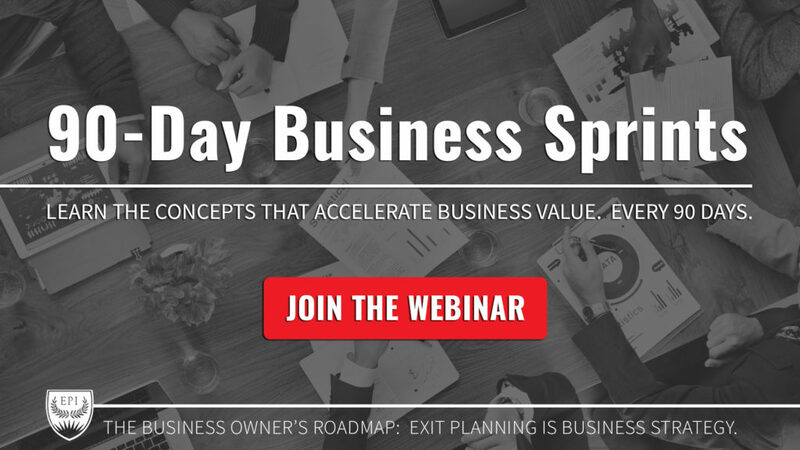 Learn the concepts that accelerate business value and unlock the wealth housed in your business. And see those changes enhance your performance every 90 days using the Value Acceleration Methodology developed by thought leader and industry titan, Chris Snider, CEPA. Attend this webinar series every month to learn the 11 Actions an Owner Must Take to Rapidly Grow Value & Unlock Wealth, found in the award-winning book, Walking to Destiny!